In the early morning hours of November 17, 1998, a bright fireball was observed over northern New Mexico, about 150km away from Los Alamos. The bolide was part of the annual Leonid meteor shower. Although the event did not produce any sonic boom reports, it was detected by an infrared radiometer and by an intensified camera located in the state. Los Alamos National Laboratory (LANL) investigated the sighting in its role as a part of the International Monitoring System (IMS) created following the Comprehensive Test Ban Treaty (CTBT). LANL found the presence of an infrasonic signal detected by six infrasound arrays. The signal matched the time and the direction of the fireball seen in the sky. The infrasound recording indicated that the explosion occurred at 93.5 kilometer, matching the measurements from the camera. The velocity obtained for the bolide from the signal was between 920 and 1150km/s. The meteorite was calculated to have a source energy equivalent to about 1.14 tons of TNT, where source energy is the kinetic energy when the shock wave is produced because of the passage through the atmosphere or the fragmentation of the meteoroid itself. Exploding 32 km off the ground with the force of 30 atomic bombs, the Chelyabinsk meteor sent out a sonic boom that shattered thousands of panes of glass – and was picked up by the infrasound station network (Credits: Marat Ahmetvaleev). CTBT bans all nuclear explosions in all environments for military or civilian purposes. It was adopted by the United Nations General Assembly in 1996 but it has not entered into force as of April 2012, since it has been ratified by only 36 countries of the 44 required. One of the points of the treaty is to establish and operate 337 facilities of the IMS; as of April 2011, the system was 80% complete. To detect nuclear explosions, IMS employs infrasound stations using microbarographs (acoustic pressure sensors) to detect very low frequency sound waves. The investigation conducted by Douglas O. Revelle and Rodney W. Withaker at LANL showed that these detectors could also have been used to detect and measure objects entering the atmosphere. More recently, infrasound detectors were used to study the meteorite that exploded over Chelyabinsk, Russian Federation, on February 15, 2013. Earth’s orbit through the solar system passes through much solid particle debris from both comets and asteroids. These meteoroids can arrive from very different orbits and are composed of different materials such as iron, rocky stones, or carbonaceous compounds. Moreover, they can have a large range of possible sizes and densities as well as a large range of possible entry velocities. The interaction of these meteoroids with the atmosphere produces shockwaves, partly due to the very high speed at entry and partly due to the compressibility of the atmosphere. The entry speed can typically range from 50 to 300 times the speed of sound (Mach) while, to make a comparison, Lockheed SR-71 Blackbird, the fastest manned airbreathing craft, had as maximum peak speed Mach 3.2. A direct consequence of this high speed is an explosion generated along a cylindrical path on the entry trajectory. The blast wave radius delineates the size of the region in which an explosion has occurred. Large meteoroids, such as the one that exploded above Chelyabinsk, penetrate the atmosphere down to heights where the atmosphere is sufficiently dense to produce a shock wave. While thunder usually produces a sound source with a wavelength on a scale of about 2-3m, the shock wave generated by meteorites can range from 10 meters to many kilometers in length. Sound sources of such magnitude in the atmosphere can have very large amplitudes, enough to break glass windows at close range as observed in the Chelyabinsk region. The frequencies are low enough that they can be characterized as infrasound, meaning the peak energy is below the range of audible sound waves. As the blast wave radius increases, the frequencies become progressively lower. In the Tunguska event, in 1908, ultra-low sound frequencies of 1/60 Hz were observed at great distances from the entry trajectory. 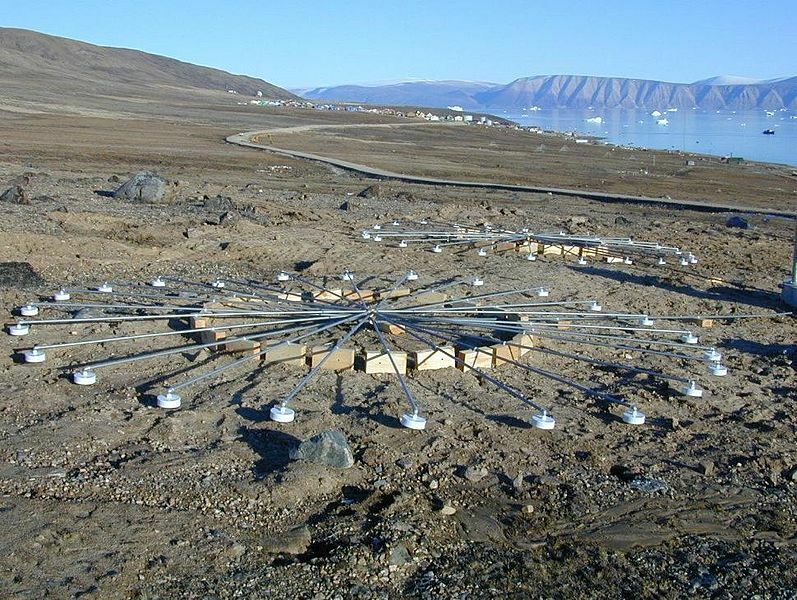 Infrasound arrays at an infrasound station at Qaanaaq, Greenland, part of the Nuclear Test Ban Treaty monitoring system (Credits: CTBT Organization). According to Revelle, an array of low frequency sensors horizontally separated by a few hundred meters to a few kilometers can be used to determine both the direction and the elevation angle of the signals. The determination uniquely locates the infrasound sources in a three-dimensional space within the atmosphere within certain errors. Such data are also useful to estimate the frequency of occurrence of certain types of meteoroids. Revelle estimates that an event with the energy level of 10Mt, such as Tunguska, is likely to happen once every 120 years. However, data from infrasound measurements reported that 30 ±9 large bolides with an energy level of 0.1kt are likely to enter Earth’s atmosphere every year. The data shows that the number of entering debris increases as the source energy decreases and vice versa. Historically, the primary source of data collection for reentering objects has always been visual or optical observations. However, due to the extensive deployment of ILS infrasound sensors, this mode has shown its relevance along with radar and optical observation for the study of meteor physics. The Los Alamos investigation was one of the first times that infrasound detection has been used to study objects reentering the atmosphere. Revelle’s pioneering theoretical work on interaction between meteors and atmosphere led the way for future studies. This article was first published in Space Safety Magazine Issue 7 Spring 2013 as part of a special report on Potentially Hazardous Asteroids.